The wondrously lavish chrome studded B-58 cockpit. The original chrome is flawless on this low mileage Buick and thankfully required no expensive restoration. The steering wheel shows no wear and has no cracks or weathering. 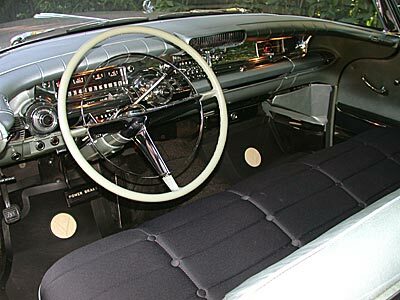 The silver leather and silky Mojave cloth seats are like new. This Limited literally caresses its occupants in the lap of luxury. The original optional "Carpet Saver" floormats are extremely rare and irreplaceable. Few (if any) Limiteds still have them today.